In my last post I showed you the fabric organizer that I made to take along on my upcoming trip to Italy. I thought you might like more specifics about what's going in the kit. If I had to, I could get by with nothing more than a pencil, a Pitt pen and my sketchbook. Sometimes that's all I take when I go out to sketch, but for this trip, I want options. 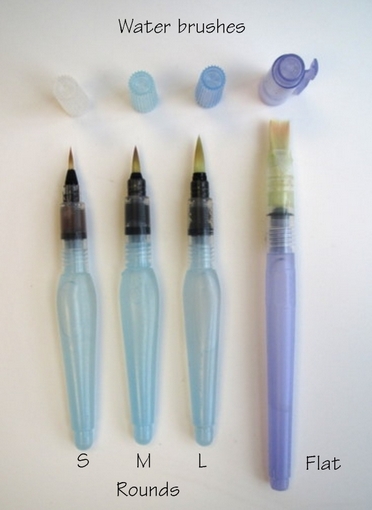 I'd like a good selection of watercolors and brushes, and a few choices when it comes to tools. It may look like a lot when it's all laid out here in the photos, but everything will fit into my compact kit and be easily stashed in my backpack. First and foremost is the sketchbook. I've decided to take two10" x 7" Stillman & Birn Beta Series sketchbooks. 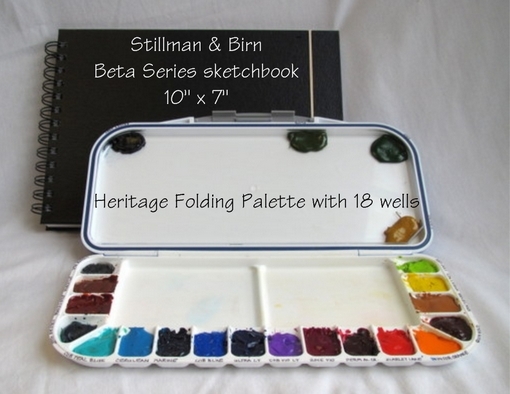 (Info about where to buy Stillman and Birn sketchbooks can be found here.) The Beta Series contains white 180 lb. cold-pressed paper which doesn't warp when it gets wet or allow ink lines to show through to the reverse side. It should be perfect for my watercolor travel journal. The Beta doesn't usually come in a 10x7 landscape format but when I called Stillman and Birn a few months ago to inquire as to whether they had any plans to offer that size, the wonderful folks there said they'd be happy to make a few for me, just to take on this trip. Can you see why I love this company? Great products and nice people - the perfect combination! These paints are a mix of tube colors from Winsor & Newton, Daniel Smith, American Journey, and Holbein. When filling the wells with paint, I make sure it's level, not mounded, and allow it to dry overnight. When I'm ready to paint, I'll spritz the dry paint with water and allow it to soften a bit. 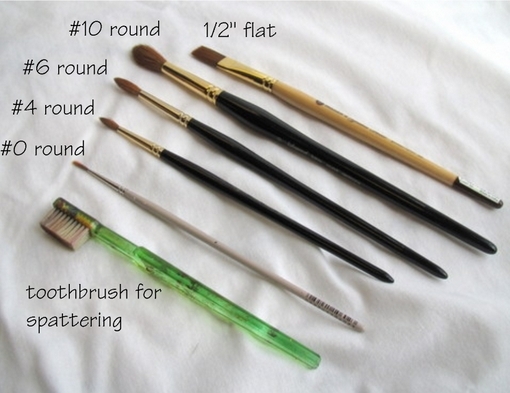 The brushes below are what I normally use for plein air painting. The rounds are sables from Cheap Joe's, and the flat is Cheap Joe's Golden Fleece. (I usually include a #8 round, also.) 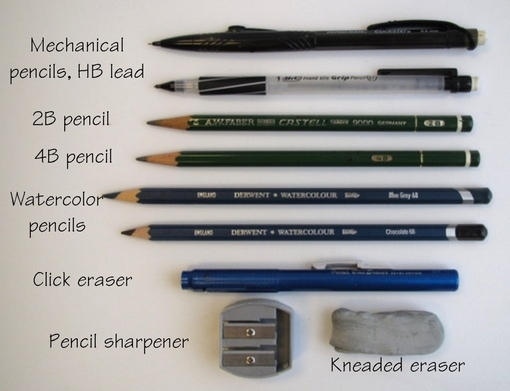 #6 and #8 rounds are what I tend to use the most when I'm sketching outdoors. 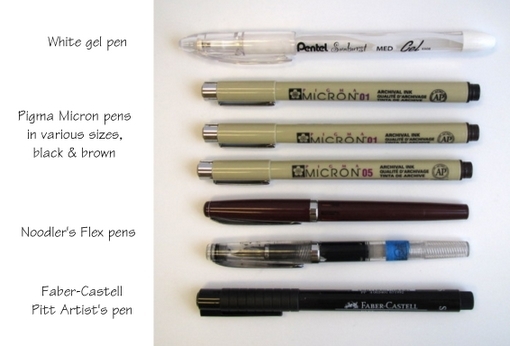 The tiny #0 is mostly for lettering text and drawing electrical wires or fencing. I sometimes take a rigger brush, too, for painting tree branches. I have a love/hate relationship with water brushes. The biggest drawback to them is how difficult it is to control the water flow. I also don't care for the quality of the bristles. They may come in handy though, when it's not convenient to set up a water container, so I'll take them along. It's a collapsible silicone mug that only weighs 2.1 oz. and collapses down to just 1/2" thick. It will slide right into one of the outside pockets of my sketch kit. 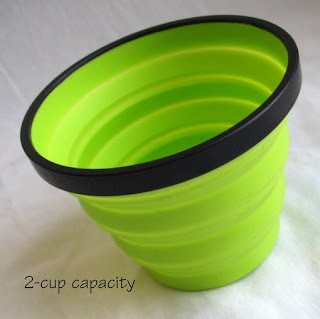 It can be expanded to hold just a small amount of water or opened up all the way to hold 16 oz. Okay, I know you're going to think I'm going overboard with the number of drawing tools I'm packing, but here's the justification for what I'm taking: I usually do a quick preliminary sketch with a mechanical pencil to get the proportions and perspective right, then use my fountain pen to do the actual drawing. But this vacation is primarily a sketching trip, and I think it would be a great time to try doing some sketches with a heavier pencil line like the 4B, and watercolor, but no ink. I'd also like to do a few sketches with the blue-grey and chocolate Derwent watercolor pencils. We'll see if it actually happens. I only own one type of fountain pen - the Noodler's Nib Creaper Flex pen. That's what I do most of my sketching with here at home and what I plan to use on the trip. But sometimes pens clog or nibs get scratchy or a hundred other things can happen that might make me wish I had brought an alternate means of sketching, so I'm taking a few felt tip pens along, too. Workhorses like the Pigma Micron pens and Faber-Castell Pitt Artist's pens are great for sketching and I'm comfortable using them. I'm sure they will be put to good use. The white gel pen is for adding highlights that may have been lost in the painting process. I don't use it too often, but sometimes a white accent is just what's needed. The metal spatter screen is fun and easy to use to add a fine spray of texture to a sketch. 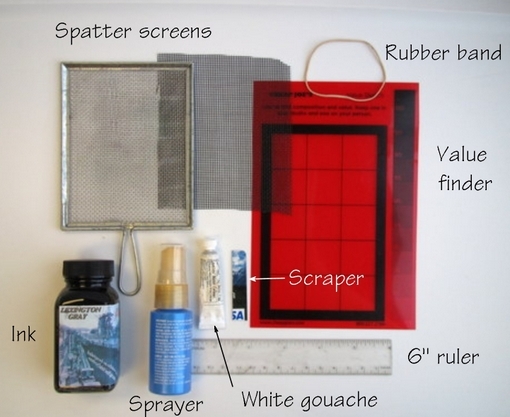 The piece of vinyl screening can be loaded with paint and pressed onto the page to add a pattern or texture. The rubber band will hold down the pages of my sketchbook on a windy day. The Noodler's Lexington Gray ink is my favorite for sketching as it's waterproof and fast-drying. I also like that the color is just a tad softer than full-on black. I'll be using this ink to refill my fountain pens. The small sprayer is for rewetting the paints on my palette prior to painting. I also use it to wet the sky area on my paper for wet-in-wet painting. The small tube of white gouache is for adding highlights. I rarely use it, but may take it along. A small piece of old credit card comes in handy to scrape away wet paint for various effects. A 6" plastic ruler helps me lay out pages for a gridded composition. 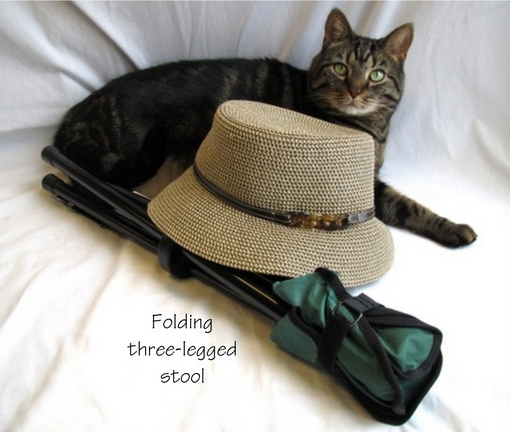 As if all that weren't enough, I've decided to take along a folding three-legged stool. My painting buddy, Suzie, and I figured we're going to be spending a lot of hours sketching and we might as well be semi-comfortable. It's springtime, and the ground may be wet - best not to be sitting down there with the worms and slugs. And the last art supply I'm taking is my cute new hat. It's packable, and has enough of a brim to keep the sun out of my eyes, but doesn't look like beach wear. I think it will be just perfect. I've been planning for months, now let the fun begin! I loved reading all your comments this week and hearing about your favorite vacation spots. It's nice to feel a connection with all of you. Thanks so much for taking the time to write. When it came time to pick the winner of the free book, I decided to do it the old fashioned way. Instead of using an online random number generator, I had my grandson Nicholas draw the winning number from twenty-one slips of paper that I put in a basket. And the winner is commenter #2 - Crystal Smith. Congratulations, Crystal! I hope you and your son enjoy the book. Just drop me an email at ljfehling@gmail.com to arrange for delivery of An Illustrated Journey. Book Giveaway -- An Illustrated Journey! In a mere eighteen days, I am going to be on my way to Italy! I can't tell you how excited I am at the prospect. My sketching buddy, Suzie, and I will be housesitting for a friend for ten days in Vicenza, in northern Italy, then we'll travel south for a taste of Tuscany and Florence before heading home. We're looking forward to soaking up the beautiful scenery, learning about the culture, tasting the wine, and eating lots of gelato. We'll both be sketching like mad and keeping an illustrated travel journal of our adventures - everything from those first hours of waiting impatiently for the flight to leave JFK, to sipping an expresso at a sidewalk cafe in Venice. I can't wait to get started! Because I love travel sketching so much, I couldn't wait to get my hands on Danny Gregory's newest book, An Illustrated Journey: Inspiration from the Private Art Journals of Traveling Artists, Illustrators, and Designers. Reading about the unique approaches and styles of the various artists featured in the book gave me lots of great ideas for things I might want to try on my own illustrated journey. One lucky person will win a brand-new copy of An Illustrated Journey. All you have to do to enter is leave a comment on this post. I'd love to hear about where you'd like to vacation if you had the chance, or where you're going this summer. Or just say hi, but be sure to enter! I'll announce the winner next Friday, March 22nd. Good luck! My sweet little granddaughter, Callista Rose, is five months old today! I think she's just about the cutest baby I've ever seen, and her happy personality and great big smile have brightened our lives immeasurably these past few months. 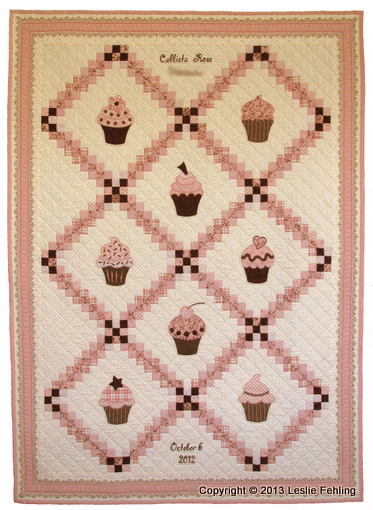 It's based on the traditional Irish Chain pattern, with appliqued cupcakes filling the empty squares between the pieced areas. I embroidered her full name and birthdate by hand using DMC floss. I selected a font that I liked on the computer, then printed out the lettering in the desired size. A blue washout marker was used to trace the lettering onto the fabric, then I did the stitching. The collection of cotton quilt fabrics included a border print which I used as the main border around the pieced area of the quilt. Other strips of the border fabric were cut and used as binding for the quilt. Precision was necessary to have just the portion that I wanted on the design to show, like this thin line of darker pink on the back. The quilt is backed with creamy white non-pilling polar fleece. It provides a nice soft surface for the baby to lie on or under, and it's a breeze to quilt. I machine quilted Callie's Cupcake Quilt on my Bernina 1630 sewing machine. I sketched out lots of design possibilities for the cupcakes, then narrowed it down to just eight. wavy lines of frosting and a cute little heart on top. The quilt has a light polyester batting which keeps it soft, supple, and not too heavy. Callie loves her new quilt from Grandma! 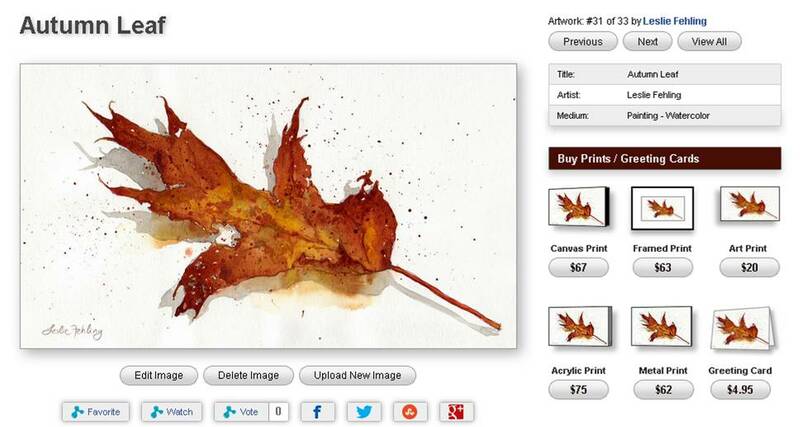 I am happy to announce the opening of a new online shop for my watercolors. Many of the sketches you see on this blog are now available online as fine art giclee prints (digital ink jet reproductions.) I'm partnering with Fine Art America, a print-on-demand service which offers an amazing array of possibilities for art reproduction. My artwork will now be available as prints on paper, canvas, or metal, as well as in greeting card format. I encourage you to click on this link and pop on over to the website to play around with it a bit. 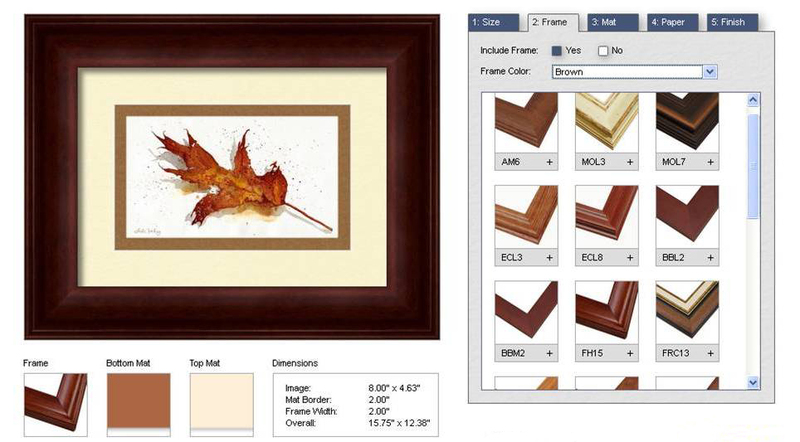 Select a painting, then try out various combinations of matting and framing options. A 3-D rendering will show you exactly how the artwork will look with the selections you've made. For years my art has been offered for sale at our local gallery here in Waynesburg, PA (and will continue to be), but until now I haven't had a convenient way to offer high-quality prints of my work to people who don't live nearby. I'm glad I finally found a way to do that. I've uploaded over thirty of my paintings and sketches to start and will continue to add more. If there is something you'd like to see in my shop, just let me know. I hope you enjoy looking around.